I love snow, it maybe the misplaced New Englander in me. I grew up in New England but have lived in Maryland for the past 16 years. I definitely miss the weather. When it snows in Maryland the world stops where back home it is just expected. LOL As soon as I saw Laura's sketch I knew I wanted to use snowflakes. I had just received my order which had Two Cool Dudes and Frosty Day designer paper in it. I decided to flip the sketch to see what happened. I layered two different sizes chocolate chip ribbon and I sewed through the old olive scallop edge. I cut out the snowflakes and adhered the buttons and used the floss to sew through the buttons. Enjoy and thanks for stopping by. Ooooh I love the colors you used:) Darling! 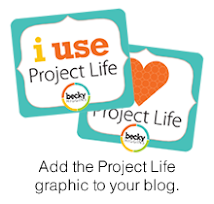 hey to a fellow MD'er! love that card! the colors are devine! So pretty! Love how your turned the sketch, love that pp too. The stitching on the olive paper is so pretty. Great job on the sketch. Oh how pretty! 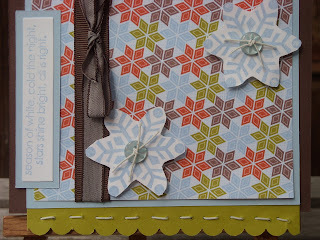 Love the colors you've used paired with the snowflakes, adorable card! Good idea on flipping the sketch! I love that DP. TFS! Wonderful card. I love what you did with the sketch. 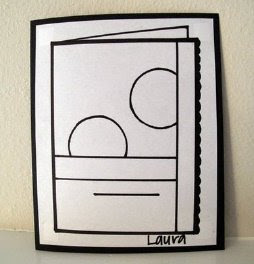 Your sewing makes the card! That paper is lovely. Great card.